The Caitlin A arrived at the marina on a sweltering day in early August, an Atlantic bluefin tuna lying across the width of the deck. It was the latest entry in the Sturdivant Island Tuna Tournament, held every year on the waters of Casco Bay off South Portland, Maine, to see who can land the heaviest tuna. 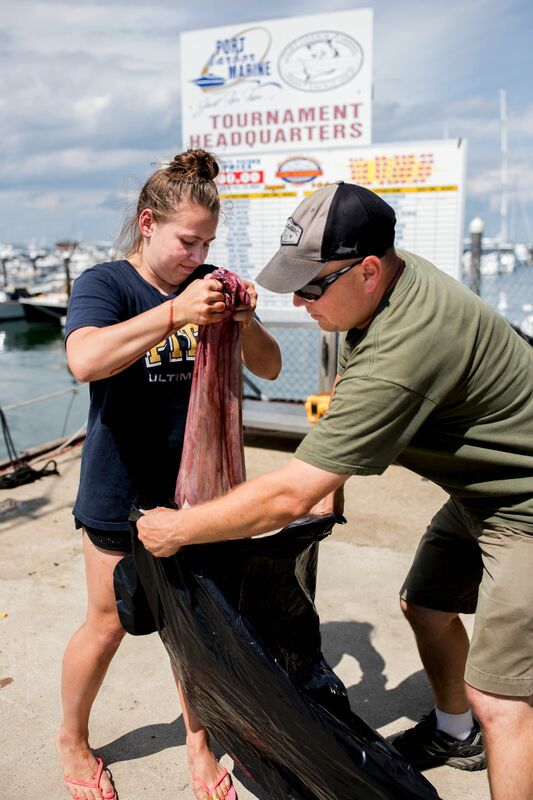 Among those waiting at the marina were Michaela Pinette ’19, a summer intern at the Gulf of Maine Research Institute, and her GMRI research supervisor, Walt Golet, ready to help with the weighing and, later, to commandeer the fish’s head and stomach for research. From the boat, the crew handed off the tuna’s gills and guts, removed as they cleaned the fish. Pinette and Golet put the gills and guts into a tote attached to a hanging scale. After draining the blood from the tote and weighing the guts — 42.5 pounds — Pinette, in an old T-shirt, shorts, and flip flops, located the stomach and set it aside. The contents would provide important data about what the fish had eaten, and thus where it had been. Then the crew of the Caitlin A, joined by Pinette, a second GMRI intern, and the tourney’s land-based weigh masters, hoisted the tuna’s body out of the boat and hooked it by the tail to the crane-like hanging scale. A few months ago, Pinette, a biology and economics double major from nearby Cape Elizabeth, would not have expected to spend her summer sifting through tuna parts for science, nor did she know it was a focus of study at all. 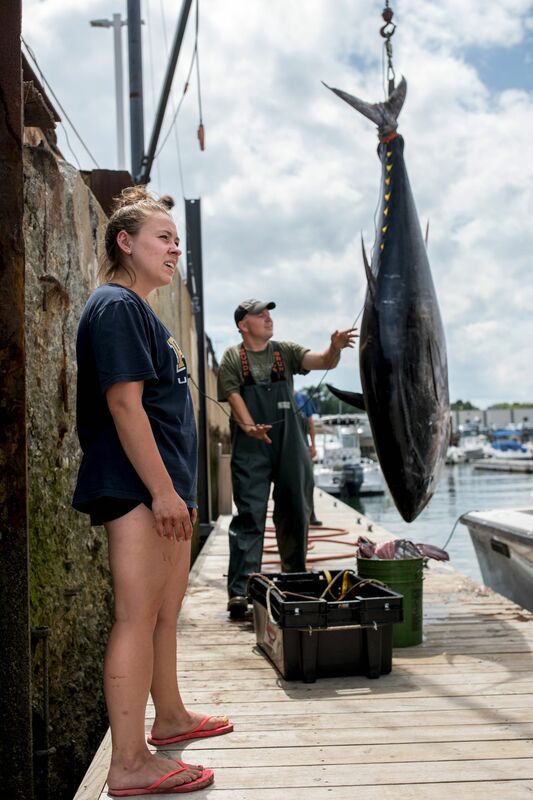 Michaela Pinette ’19 watches as Walt Drolet guides a tuna that’s hoisted from the Caitlin A fishing boat. (Phyllis Graber Jensen/Bates College). When it came time to figure out what to do over the summer, Pinette turned to the Bates Career Development Center, hoping to find a position that integrated her two majors. “I didn’t even know what you can do with biology and econ, if you could use them at the same time,” she says. A BCDC staff member told her about GMRI. 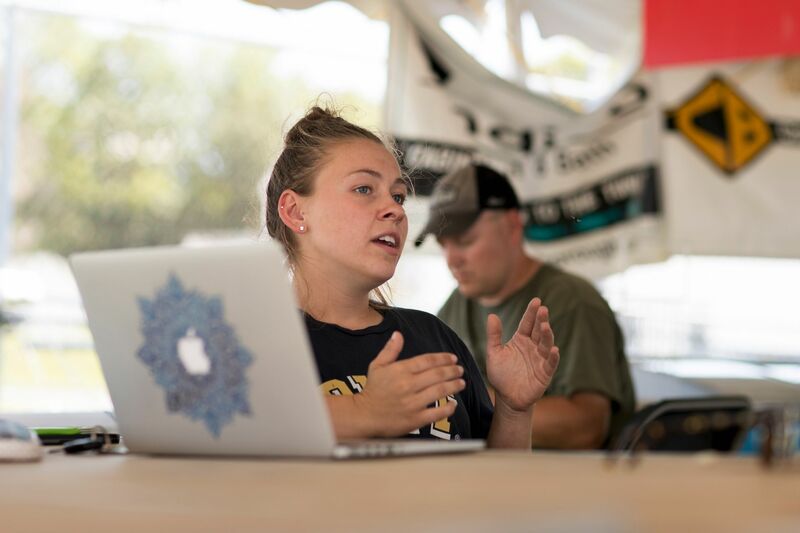 Part of the institute’s work involves studying both marine ecosystems and their impact on people — and, as a core employer through the Bates Purposeful Work initiative, it prioritizes hiring Bates interns. Pinette landed the internship and was soon immersed in the world of foraging ecology: studying what bluefin tuna eat, where the migratory fish go, how many there are, and to what extent fish from the eastern and western Atlantic Ocean mix with each other. She’s spent her summer helping to analyze the squid, herring, and mackerel she finds in the fish’s stomachs. 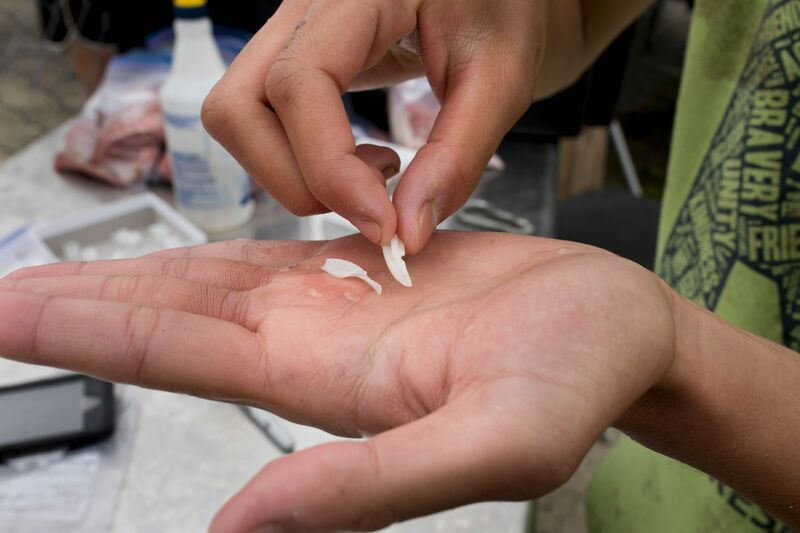 From the fish heads, she extracts and takes samples from otoliths, a bony inner ear structure that contains chemical “signatures” that, when analyzed, can determine the age and spawning origin of the individual fish. Walt Golet, Pinette’s supervisor, is a research assistant professor at the University of Maine and a GMRI research scientist who supervises interns from several colleges. He tries to expose his interns to several aspects of GMRI’s work, so that they’ll be able to take their skills to other jobs related to fisheries. When Pinette is done with her internship, she’ll be in tune with more than tuna, Golet says. In addition, as a Purposeful Work intern, Pinette is taking part in reflection activities designed to help her identify what she finds personally meaningful about her work — valuable self-knowledge that will guide her career path. For one, Pinette now knows that fieldwork feels particularly purposeful. “That’s the most fun, dissecting the fish,” says Michaela Pinette, shown hoisting a tuna stomach into a plastic bag held by GMRI researcher Walt Golet. (Phyllis Graber Jensen/Bates College). Pinette isn’t only looking at the biological characteristics of tuna; she’s delving into one aspect of the economics of tuna fishing in Maine. At the end of her internship, she’ll make a presentation to GMRI staff on how tuna migrations and catches in the Gulf of Maine have changed, according to data dating back to 1974. Understanding such data could have an impact on the people who make a living fishing for tuna. “This is their livelihood, so it’s important to a lot of fishermen if the fish come in later or if the fish are smaller some years,” she says. Over the summer, Pinette’s discovered that she enjoyed the combination of fieldwork and lab work; she might consider applying to graduate school in the marine sciences. In the meantime, while Pinette and Golet waited for the tuna head, Pinette posed for a photo with the stomach of the largest fish caught so far, which weighed in at 737 pounds. If she held the stomach close to the ground, it was as tall as her hip.